For the uninitiated, Florida is the land of convenience store alligators, harrowing zip-lining mishaps, and annoying stoner dudes who interrupt news broadcasts to praise memes. But now Florida has renewed hope of shedding its reputation as the worst state in America, due to a critical mass of Chick-fil-As. 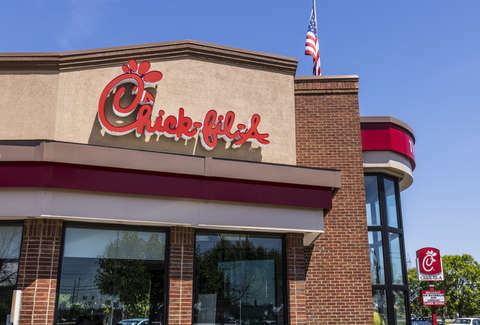 The Orlando Sentinel reports that Merritt Island, Florida will officially be home to two Chick-fil-As situated within hundreds of feet of each other, cloistered within the small city's Merritt Square Mall. On Wednesday, a new outpost in the shopping center's parking lot will open at 785 E. Merritt Island Causeway, increasing the number of Chick-fil-As within shouting distance of each other by 100%. The original restaurant is already housed in the mall's food court, at 777 E. Merritt Island Causeway, Suite 164. They're roughly 600 feet apart, according to a report by The Takeout. Presuming you read that correctly, this means two Chick-fil-As will live together happily on the same premises. For the residents of Merrit Island, the news has been greeted with fanfare and a scary cult-like enthusiasm. Florida Today reports that scores of fans have already been camping outside the forthcoming Chick-fil-A in anticipation of its opening, hoping to win a year of free meals. Previously, the building housed a TGI Fridays, but with casual dining establishments on the wane, it only makes sense for the chicken peddler to swallow its former business. Of the more than 2,200 Chick-fil-A locations providing deep fried fuel across America, it seems undeniably certain that two of them are at the same mall in Merritt Island Florida. Presumably those different times of day are breakfast, lunch, and dinner.